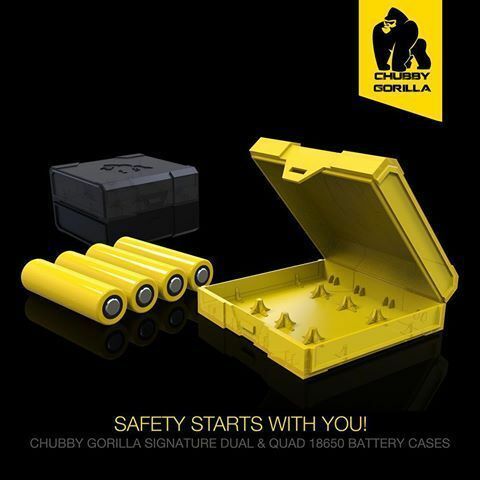 With the Chubby Gorilla Signature Battery Case in your pocket, you get safety, convenience and ultra-durable battery transport wherever you go. Our battery case comes in dual or quad battery configuration and is forged in an aggressive design from a high-strength, durable ABS so it won’t break or crack. This case comes in solid yellow and transparent black colors and it’s small enough to fit in your pocket or even your purse. The Signature Battery Case comes standard with our “Easy Fit Application” design that firmly holds your batteries in place so they don’t rattle around inside and break. # Quad Configuration for (4) 18650 Batteries. # Easy Fit Application Holds Batteries Firmly in Place. # Aggressive Styling and Super-Portable. # Ultra-Strong, High Density Plastic for Maximum Protection. # Available In Transparent Black & Solid Yellow. # Designed & Engineered In California USA.